The Crow is one of our favorite comic book movies of all time. A gritty supernatural revenge fantasy that takes place in Detroit on the night before Halloween, aka Devil's Night, the dark romance and gothic overtones were part of the magic, conjured most profoundly by the late Brandon Lee, who died during the production. Since the release of the 1994 original, we've gotten three subpar sequels and a short-lived TV series. But more intriguingly, there have been a number of starts, stops, and concepts for reboots, re-imaginings, and resurrections of Eric Draven. Here we'll take a look at The Crow movies we almost got. The Crow was created by James O'Barr an orphan who was raised in institutional and foster care and a self-taught illustrator who loved Will Eisner's The Spirit. O'Barr enlisted in the Marines after his fiancé was killed by a drunk driver. While stationed in Germany, he began to draw The Crow, inspired by his own trauma and a newspaper article about a young Detroit couple killed for a twenty-dollar engagement ring. The Crow is filled with references to Joy Division and The Cure. Eric Draven's look and movements are a combination of Peter Murphy and Iggy Pop. Producer Jeff Most was developing a movie at Warner Bros. with cyberpunk novelist John Shirley when he heard about James O'Barr and picked up the last two copies of The Crow from LA's Golden Apple Comics. After making a deal with O'Barr, Most hooked up with Wall Street producer Ed Pressman to make a Crow film with a script by Shirley. 'Though names like Johnny Depp, Christian Slater, and even Jon Bon Jovi were tossed around, Brandon Lee was the only actor to receive an offer. Lee was signed on for two sequels, but his tragic death in an on-set accident made the completion of the original uncertain, let alone the idea of future movies. The Crow was a hit for Dimension Films when it made it to the screen in 1994. Two years afterward, Kitchen Sink Press published new stories with different characters as The Crow, including an American Indian in "The Crow: Dead Time," a Federal Conservation officer in "The Crow: Flesh and Blood," and a man battling the Chinese mafia in "The Crow: Waking Nightmares". Comic stories like these helped open the door to making a movie sequel without recasting the role of Eric Draven. David S. Goyer, who went on to write Blade, Batman Begins, and Man of Steel, wrote The Crow: City of Angels, which starred Vincent Perez as Ashe Corven, a new Crow style character. Although the first Crow sequel included James O'Barr muse Iggy Pop as one of its villains, it proved to be a misfire. Some 15 years later, director Tim Pope released a six-minute video detailing what his The Crow 2 could've been had the studio not meddled with his vision in an effort to make it more derivative of the first film. One of the artists from the City of Angels soundtrack nearly made his directorial debut with a Crow sequel of his own. Rob Zombie wrote a screenplay called The Crow 2037: A New Age of Gods and Monsters. An MTV News report in 1997 revealed shooting was set to begin that year. His script for The Crow: 2037 has since surfaced online. Set in the future, as the title suggests, a boy and his mother are murdered by a Satanic priest on Halloween. The boy returns as The Crow, to seek revenge. But instead of a Rob Zombie Crow movie, the short-lived television series The Crow: Stairway to Heaven arrived in 1998. The show brought back the character of Eric Draven, played by future Iron Chef America host Mark Dacascos. After the show's cancellation, the producers made another attempt at a theatrical tale, releasing The Crow: Salvation in 2000, with Eric Mabius as a man wrongly convicted and executed for the murder of his girlfriend. Salvation played in a single movie theater, before it was unceremoniously dumped onto home video. The cast also included Kirsten Dunst and Fred Ward, with the great Walton Goggins in a small role. Producer Jeff Most is credited as a cowriter on the awful mess that became 2005's The Crow: Wicked Prayer, which starred Edward Furlong as Jimmy, who returns after he and his girlfriend are murdered in a satanic ritual. Another direct to video affair, Wicked Prayer's cast included David Boreanz, Tara Reid, Danny Trejo, and Dennis Hopper. Nearly 15 years after the release of the original, Jeff Most and Edward Pressman moved forward with the idea of rebooting and/or "reinventing" the original. Stephen Norrington, who directed the first Blade and the widely panned The League of Extraordinary Gentlemen, was the first director attached to the project. In 2008, he told Variety, "Whereas [the] original was gloriously gothic and stylized, the new movie will be realistic, hard-edged and mysterious, almost documentary-style." Ed Pressman described Norrington's script as "terrific," telling MTV that the story would be set in two locations - Mexico or the American Southwest and a more urban setting, like Pittsburgh or the original movie's Detroit. Then, in 2010, The Wrap reported that iconic rock musician Nick Cave had been hired to do a rewrite. An offer was reportedly made to Mark Wahlberg to star. But Norrington was off the project just a few months after Cave worked on the script. He couldn't confirm Walhberg's involvement, but he told Mania in an October 2010 interview that he left after an unnamed actor (probably not Wahlberg) demanded another rewrite of the screenplay. "As I had gotten involved explicitly as a writer-director my exit was inevitable," he told Mania. "I was bummed. I had developed a genuinely authentic take that respected the source material while moving beyond it, and Nick Cave came in and added more depth. I think fans would have been pleasantly surprised." The next director officially attached to The Crow reboot, following Norrington's exit, was 28 Weeks Later filmmaker Juan Carlos Fresnadillo. He teamed with Alex Tse, who worked on Watchmen, to co-write the script. An April 2011 press release said production would start in the fall and the story would be a "reboot" for Eric Draven. Shortly after that announcement, the Hollywood Reporter revealed that Bradley Cooper was circling the role. He was eventually more formally attached, 'though he was out of the picture by August of that year, citing scheduling conflicts. Some concept artwork did emerge showing what Cooper's take on Draven would've looked like. Incidentally, Cooper's schedule conflict involved the proposed motion capture epic Paradise Lost, in which he'd have played Lucifer for original The Crow director Alex Proyas. That project was shut down in 2012. Cooper ended up making Silver Linings Playbook, which became available when Mark Wahlberg dropped out. Wahlberg's name surfaced again as a potential Eric Draven, with other rumors mentioning Channing Tatum, Ryan Gosling, and James McAvoy. As Cooper himself noted to Empire while promoting the DVD release of The Hangover Part II, Fresnadillo was out the door on The Crow reboot right behind him. In early 2012, Variety reported that producers tapped F. Javier Gutierrez to direct their "gritty reinvention," this time from a script by Jesse Wigutow, who worked on a Tron sequel and was later hired to adapt the graphic novel Fire as a vehicle for Zac Efron. Next came a script from Cliff Dorfman, whose credits include HBO's Entourage and Warrior. Tom Hiddleston was reportedly offered the lead after an impressive makeup test, but decided to pass. Alexander Skarsgaard was said to be circling. But it was Luke Evans who became the next actor formally attached. Norman Reedus and Kristen Stewart were reportedly up for supporting roles. Though James O'Barr has long expressed his respect and admiration for Brandon Lee and Alex Proyas, the reboot aspired to be even more faithful to O'Barr's comic series than the 1994 original. "I'm a huge, huge fan of both the first film and James O'Barr's graphic novel. I was obsessed with The Crow when I was growing up. When I heard about the remake, what I thought could be very interesting today, 20 years later, especially with this whole Marvel Universe that's happened, is that the Crow always stood as an outsider to me. I kind of felt he would be the right character for me if I got the chance to do it. And now that I have gotten the chance to do it, I'm very much going back to the graphic novel, particularly looking into the illustrations themselves as much as the story, and picking out all those beautiful ideas and details that haven't really been used yet... I want to make a movie that I would have wanted to see, as a huge fan of The Crow." Evans, who had been attached for over a year, was the next lead to exit. His publicist confirmed as much to The Wrap in late January 2015, citing his busy schedule. Two months later, Hardy had a new Crow, with production scheduled for later that year. Jack Huston, best known as sniper Richard Harrow on HBO's Boardwalk Empire emerged as the new Eric Draven just over a month after Luke Evans was gone. O'Barr himself gave his approval, telling a convention crowd he was, "really happy with that choice." Jessica Brown Findlay, our favorite actress from TV's Downton Abbey, was cast as Eric's fiancé Shelly Webster; Forest Whitaker was in talks about an unspecified role; and Andrea Riseborough, from Oblivion and 2015 Best Picture winner Birdman, was in negotiations to tackle a new iteration of The Crow's big bad, Top Dollar. But even as preproduction began in Wales, Huston was suddenly gone. "I was so excited about it," he lamented in an interview with Collider while promoting another film. "We were all so jazzed to do it." Nevertheless, Hardy insisted the reboot was moving forward, stating via press release: "Jack Huston is unfortunately unavailable to continue with us... The Crow is an amazing project, and I am grateful that we have the time and patience to get it right. We look forward to unveiling our new lead and starting to film over the next several weeks." Variety reported that producers were looking at Nicholas Hoult, from the X-Men franchise, and Jack O'Connell, part of the This is England ensemble, as potential replacements. Jason Momoa posted a photo on Instagram of he and Corin Hardy having beers together in August 2016, with a caption about "seal[ing] the deal" and hashtags including, "#greatnewstocome," "#dreamjob," and "#cantwaittotelltheworld." As promotion geared up for Justice League, Mashable confirmed the star was in talks to star in The Crow, with their sources saying he'd found a way to work it around his DCEU duties. In November, the Aquaman star captioned a fan created image of The Crow, with, "I've been waiting for sooooo long. @corinhardy let's do this brother." In March 2018, the studio announced an October 11, 2019 release date. The following month, Momoa expressed his love for the first film, which he saw as a teenager, as well as the source material, which the reboot would follow more closely. "I loved the graphic novel," the actor told Entertainment Weekly in an April 2018 interview. "I just got a first edition. I got it signed... It's an honor to play it." And then just a month after that, The Crow reboot fell apart, this time reportedly due to financial issues stemming from a behind-the-scenes dispute among the suits. Momoa took to Instagram again. "I've waited 8 years to play this dream role. I love you @corinhardy and @sonypictures unfortunately I may have to wait 8 more. Not our team. But I swear I will. James O'Barr sorry to let you down I won't on the next. This film needs to be set free. And to the fans. Sorry. I can't play anything but what this film deserves and it needs love. I'm ready when it's right. Love u Corin." The director posted a photo of his own on Twitter the next day, with a simple emoji. 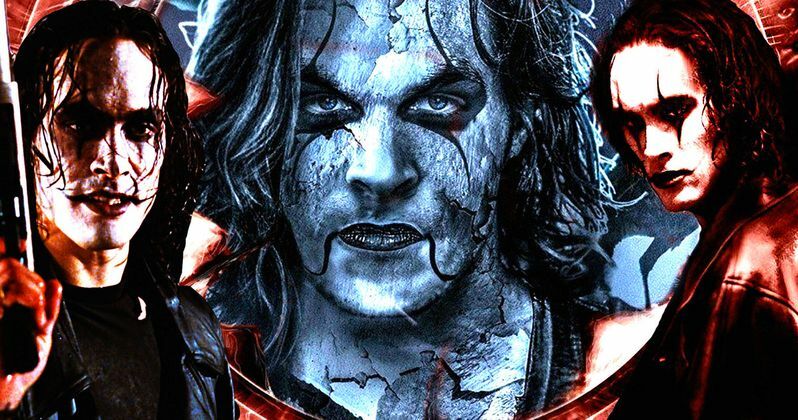 Will The Crow ever return to the big screen? And more importantly, should it? At least one of the visionaries responsible for the original film thinks the story of Eric Draven and Shelly Webster should be left alone. In December 2017, Alex Proyas posted a photo of a young Brandon Lee with his father, martial arts legend Bruce Lee, with a statement titled, "WHY I THINK THE CROW SHOULD NOT BE REMADE." "I was privileged to know Brandon Lee - he was a young, immensely gifted actor with a great sense of humor and a bright future ahead of him," the post began. "I was also privileged to have been able to call him a friend. Our working relationship as actor/director went beyond mere collaboration. We crafted a movie together, which has touched many people. I did not take a 'film by' credit on THE CROW. I wanted it to be Brandon's movie, because it was, and because he would not be able to make any more movies. He brought all his passion to the movie and it has lasted as his legacy. It is a film I know he would have been proud of. I finished the film for Brandon - struggling through grief, along with the hugely supportive cast & crew who all loved Brandon, to complete it in his absence. We were imbued with the strength of Brandon's spirit and his inspiration. Not only Brandon's wonderful work as an actor and a filmmaker, but as a man, whose humanity had touched us. THE CROW would not be a movie worth 'remaking' if it wasn't for Brandon Lee. If it wasn't for Brandon you may never have even heard of this poignant little underground comic. It is Brandon's movie. I believe it is a special case where Hollywood should just let it remain a testament to a man's immense talent and ultimate sacrifice - and not have others rewrite that story or add to it. I know sequels were made, and TV shows, and what have you, but the notion of 'rebooting' this story, and the original character - a character Brandon gave life to at too high a cost - seems wrong to me. Please let this remain Brandon's film."